Throughout October and early November 2006, the LTTE and Sri Lankan military exchanged artillery fire in and around the Vaharai area about 80 kilometers north of Batticaloa town. Vaharai remained under LTTE control until mid-January 2007. On November 8, 2006, the fighting turned deadly for Tamil civilians trapped in the conflict zone. Human Rights Watch conducted interviews with 12 witnesses to the attack. All said that the shells landed without warning and that, while the LTTE was frequently milling about the area, no LTTE fighters were located in or adjacent to the IDP camp at the time of the attack or directly before. The LTTE had sentries in the area of the camp, ostensibly to monitor the movement of displaced persons, they said, but the nearest LTTE military base was the Sinnakangai camp on the coast about two kilometers away. None of the interviewees had seen or heard outgoing shelling earlier that day. The mother took her daughter to the nearby Vaharai hospital, where she died. The son went to the Batticaloa hospital, where doctors removed shrapnel from his leg. A mother of four children explained how her husband died in the attack. 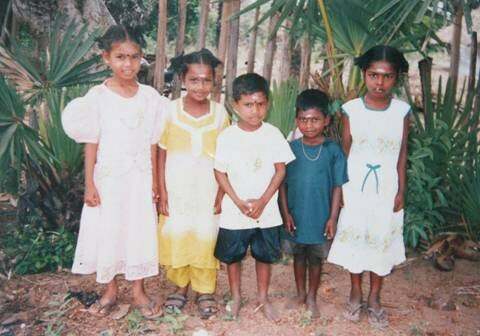 The family had come to the Vaharai area from Mutur in July 2006, she said. They stayed in a house about 500 meters from the school. The mother was seven-and-a-half months pregnant when the attack took place. In total, 62 people died. According to hospital records obtained by Human Rights Watch, 47 people, ranging in age from one to 74 years old, suffered injuries. Twenty-three of these victims were under 18. Twenty-one were women and 26 were men. In addition, the location of the displaced persons camp was known to the government and should have been known to local army commanders. The camp had opened on August 8 and received regular supplies from the ICRC and the Italian Red Cross. Aerial observers would have spotted the numerous tin and palm-leaf huts on the school grounds. As alleged evidence of LTTE military activity in the school, the government pointed to the many bunkers on the school grounds. Displaced persons who spent time in the camp readily admitted to Human Rights Watch that they had dug bunkers. The purpose was to protect their families from government shelling, they saida common practice in Sri Lankas militarily contested areas. We built a bunker for ourselves in the camp for our protection, said the man who lost his wife. The woman who lost her husband said that about 15 LTTE fighters stayed in some huts about 600 meters from the school. They had rifles but no heavy guns, she said.77 This matches other reports that the LTTE had sentries around the camp. Even if the LTTE had exercised control over the IDP camp, that would not have affected the camps fundamentally civilian nature that prohibited attacks against it. Having guards around the camp and even abducting children and young adults from the camp for use as LTTE fightersas some displaced persons reported to Sri Lankan human rights activistswould not have transformed the Kathiravelli camp from a protected civilian object into a legitimate military target. In addition, the presence of LTTE forces in the vicinity of the Kathiravelli camp does not in itself make the shelling lawful. Military forces must use methods of attack and weapons that can discriminate between combatants and civilians. Anticipated civilian loss in an attack cannot be disproportionate to the expected military advantage. Thus, the military gain of attacking any LTTE forces near the Kathiravelli camp would have had to be measured against the anticipated civilian harm. Given the mobility of most LTTE artillery and the permanent and long-term nature of the Kathiriveli IDP camp, whose location was known to the government, the Sri Lankan military failed to take adequate measures to distinguish between combatants and civilians, resulting in numerous civilian deaths and injuries. 58 Civilians at the Mercy of the Tigers, Government of Sri Lanka press release, November 9, 2006, http://www.reliefweb.int/rw/RWB.NSF/db900SID/LSGZ-6VDHNJ?OpenDocument (accessed May 7, 2007). Human Rights Watch asked the government at what time the LTTE attacked SLA positions on November 8; where; and the resultant casualties. The government declined to provide the requested information due to security sensitive information. Sri Lankan government response to Human Rights Watch, July 12, 2007. 59 D.B.S. Jeyaraj, Massacre of Innocent Civilians at Kathiraweli, Transcurrents, November 11, 2006, http://transcurrents.com/tamiliana/archives/217 (accessed May 6, 2007). According to this article, five soldiers and a civilian employee were wounded and one soldier died. 60 Civilians at the Mercy of the Tigers, Government of Sri Lanka press release. Human Rights Watch asked the government what type of weapons the army fired into the Kathiravelli area; at what time; and by means of what targeting method. The government declined to provide the requested information due to security sensitive information. Sri Lankan government response to Human Rights Watch, July 12, 2007. 61 According to displaced persons present at the time of the attack, as well as a school employee, the compound had a rectangular shape. Inside stood a large assembly hall and five school buildings. 62 Human Rights Watch interview with Vaharai resident, Valaichchenai, February 26, 2007. 63 Human Rights Watch interview with Mutur resident, Valaichchenai, February 26, 2007. 64 Human Rights Watch interview with displaced person, Batticaloa, November 11, 2006. 65 Human Rights Watch interview with Vaharai resident, Valaichchenai, February 26, 2007. 66 Human Rights Watch interview with Mutur resident, Valaichchenai, February 26, 2007. 67 Human Rights Watch interview with Mutur resident, Valaichchenai, February 26, 2007. 68 Sri Lanka: ICRC Deplores Attacks on Civilians, ICRC press release, November 9, 2006, http://www.icrc.org/web/eng/siteeng0.nsf/html/sri-lanka-news-091106 (accessed May 7, 2007). 69 Human Rights Watch interview with displaced person, Batticaloa, November 11, 2006. 70 Civilians at the Mercy of the Tigers, Government of Sri Lanka press release. 71 Sri Lankan Government Regrets Civilian Massacre, Agence France-Presse, November 9, 2006. 72 Sri Lankan government response to Human Rights Watch, July 12, 2007. 73 Refugee Camp Bombing Kills 65 in Sri Lanka, Agence France-Presse, November 8, 2006. 74 Sri Lankan government response to Human Rights Watch, July 12, 2007. 76 Human Rights Watch interview with displaced person, Valaichchenai, February 26, 2007. 77 Human Rights Watch interview with Mutur resident, Valaichchenai, February 26, 2007. 78 Anuruddha Lokuhapuarachchi, Sri Lanka Says Sinks Rebel Boats as Thousands Flee, Reuters, November 8, 2006, and Anger of Lanka Civilian Deaths, BBC, November 9, 2006, http://news.bbc.co.uk/1/hi/world/south_asia/6131566.stm (accessed May 3, 2007). 79 The war in Sri Lanka is governed by international humanitarian treaty law and customary law applicable during non-international armed conflicts. Sri Lanka is a state party to the Geneva Conventions of 1949. While it is not party to the Protocol Additional of 1977 to the Geneva Conventions of 1949 relating to the Protection of Victims of International Armed Conflicts (Protocol I) or the Protocol Additional of 1977 to the Geneva Conventions of 1949 relating to the Protection of Victims of Non-International Armed Conflicts (Protocol II), most of their provisions are considered reflective of customary international law. An authoritative study of customary international humanitarian law is the ICRCs two-volume Customary International Humanitarian Law (Cambridge, UK: Cambridge University Press, 2005).